Hi there! It's Erica Cook from Moth Design. 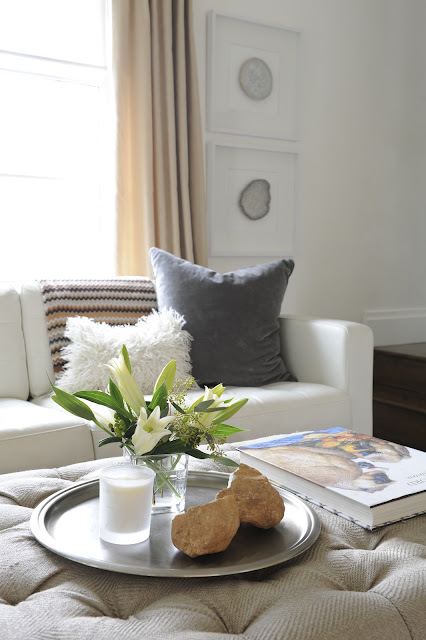 I'm delighted to be here today on La Dolce Vita for the My Favorite Room series, sharing my family room. Oh how I love this space. Aside from the kitchen, my family room is the hub of all activity in my home and the space where I spend the very most time with my 5 boys. This is where we celebrate Christmas, entertain, where we gather for movies, reading, together time, talks, etc. This room has been host to so many great memories ( my smallest little guy took his first steps here). This palette is likely one that best represents my true interior design aesthetic and it's the style I find easiest to live with. Layered neutrals and textures feel low key, yet refined. The use of leather and other washable natural fibers; a mix of linen, cotton velvet and wool, mean that we live in the space and don't worry so much about spills or wear and tear. Nothing is fussy or precious and my boys can be boys. However, the light backdrop walls, mixed metals, turned ottoman legs and some delicate accents mean the space is balanced and neither too masculine or feminine. This room was originally the kitchen in my home, before I moved it to the back of the house. It certainly isn't the largest space, but it has great windows, lots of light and has always been inviting. The art here is my own. An acrylic canvas that I did years ago and framed agate trivets. It's great to be surrounded by things you love and I find the space rejuvenates my sense of inspiration. So there you have it. My Favorite Room. 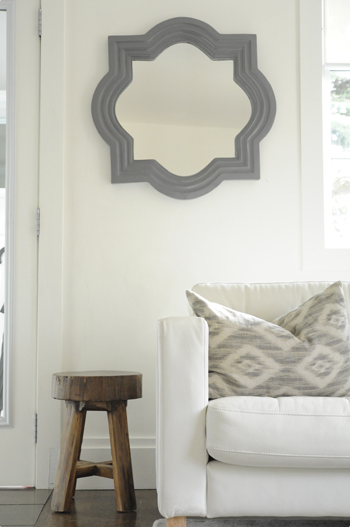 I hope you enjoy this peek in to my home. Thanks so much for having me Paloma! What a great room! Neutral but fun! Gorgeous colors and those framed agate trivets are brilliant! I would love a DIY tutorial! 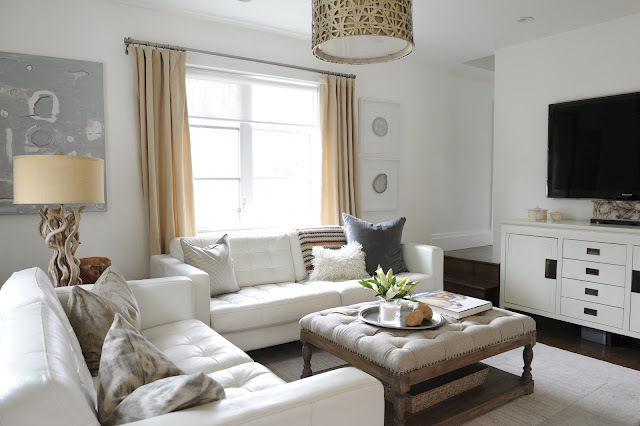 Whites and neutrals are my favorite - add just a touch of bright pink or mint and this is probably my dream living room! such a beautiful and relaxing space! Beautiful home and pretty pics to go with it. Love the pale colours and calmness of it all. Adore Erica's style overall, just stunning. Always, lovely, Erica! Love the room-- it's so bright and cheery and perfectly cozy. Gorgeous! 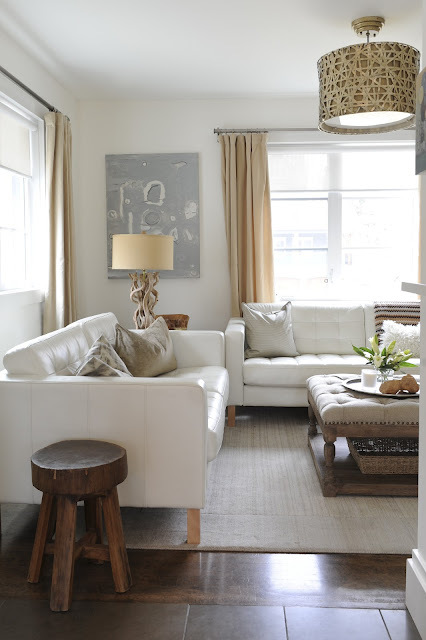 I am in love with neutrals, what a great space! It's heartwarming to read all the lovely comments. Thanks everyone. Really lovely room with a lot of light and love :) Peaceful and calm! So inviting! 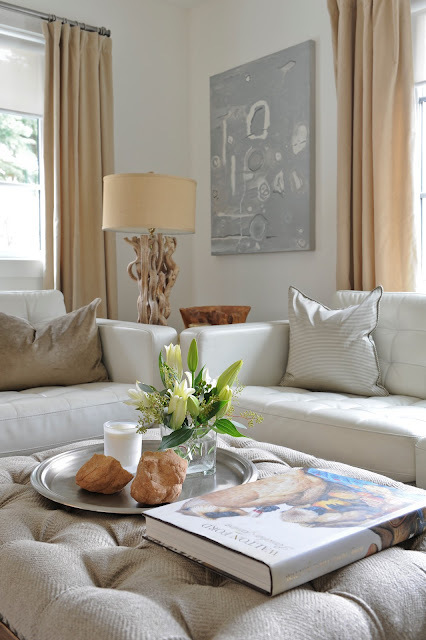 Erika, I love this space, and I'd REALLY love to know if the white leather Karlstads are truly five-boy-resistant! My husband and I are dying to get a pair of these couches, but we don't want them to be ruined when we have kids in the near future. You sound pretty confident about yours; any tricks to keeping them gorgeous despite boys being boys? Thank you!